Instead of telling you how horribly wrong the spray painting went on our “new” front door with our new Wagner sprayer last weekend (popcorn ceiling texture, anyone?) or how I bamboozled myself into thinking doing a laminate dresser would be “not that bad” (the green one) or how it took a lot longer than expected on the black campaign dresser or how the plan to remove the paint from the brick to help waterproof the basement didn’t remotely work…I’m going to show you this beautiful, wonderful, free curb dresser we picked up last weekend. It’s not really beautiful or wonderful but it came just when I was about to give up on finding a project and in general. That bad last week was relentless and I had thoughts of just quitting refinishing furniture (and at times doing what we want to the house). Not permanently (I say that now but I think my mind was somewhat set on permanent then). After a number of just bad feelings, doubt about myself and everything I do, things we planned for months (and spent a good amount of money on) not working and very little money left for us to work with, it all equated to giving up. Then we drove a block over and saw the free dresser (bathed in light in my mind) which makes it the most beautiful and wonderful thing I’ve seen in a while (besides Greg aww). Instantly I was refreshed and inspired. There may have even been a tear or two. Felt like a sign. We were also picked as featured sellers on Krrb and Apartment Therapy which helped. Two signs. I immediately started working on it. With the shape the veneer was in this could be called a solid wood putty dresser. I kid. Each layer of putty takes a bit to dry so it’s slow going but each step has me filled with joy. 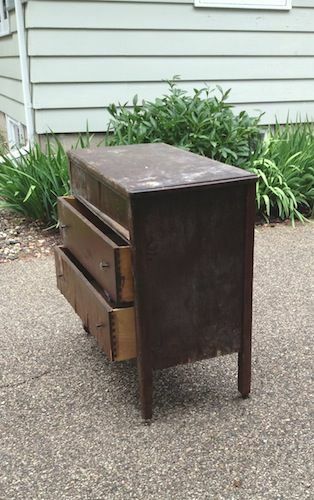 As for the two similar looking dressers, I really don’t want to tell you all that it took to get them there. I’m not happy with the quality of finish the green piece has. 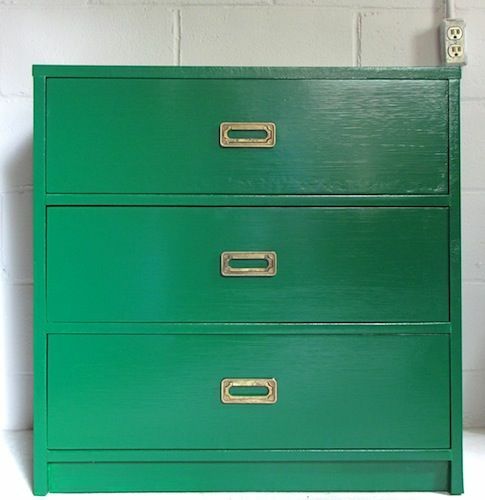 I chose a saturated emerald green to make the brass hardware pop. Since it’s partially laminate, it’s rather glossy and even after 2 coats of primer and 4 (yes 4-an entire quart of paint), it’s uneven and will need touched up after a little use. Some of it had water damage and with laminate….just….don’t. But it’s finished and some think I’m being too hard on it and myself. I’ll be happy when it leaves my sight which is the first time I’ve felt that way about a piece. 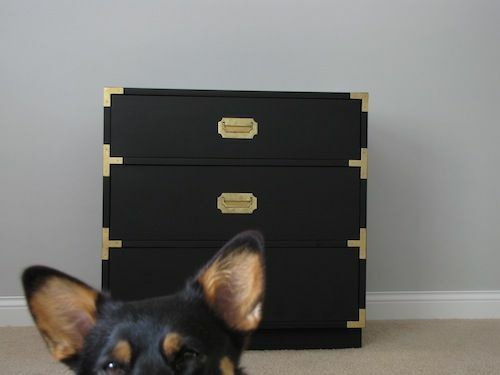 The black campaign dresser with original brass hardware and brackets turned out lovely. A lot of work for something that was to be one of the easier pieces. 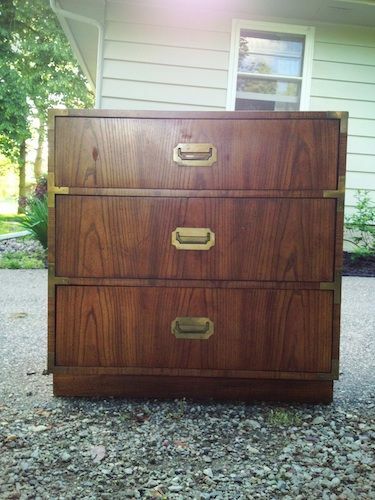 Seems kind of worth it when I see the amount of interest people have in it on etsy and craigslist. I really like this one. 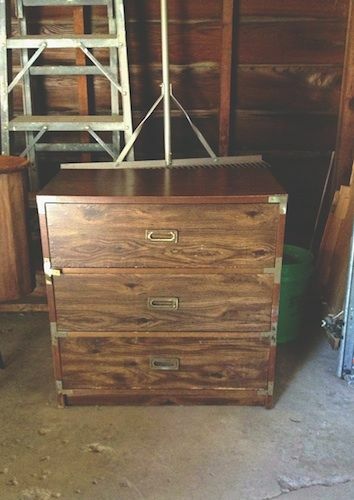 The ideal nightstand/storage/dresser in one. I chose matte black to highlight the brass hardware. I love contrast. It’s in our etsy shop and if you’re in the Minneapolis area we are close if you’d like to give it a home. Both were pains in the hardware cleaning department. 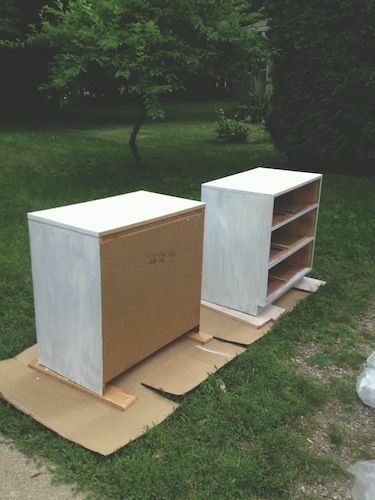 Ever have a refinishing project gone awry? 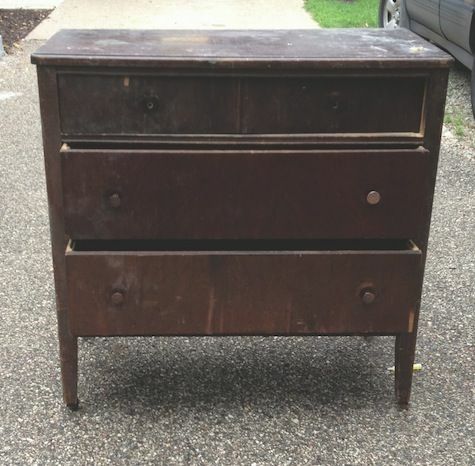 This entry was posted in Before and After, Dressers, Furniture Finds, Paint, Thrifty Finds and tagged Benjamin Moore, black, brass hardware, campaign dresser, chest of drawers, furniture, Minneapolis, Minnesota, nightstand, paint, refurbish, vintage. Bookmark the permalink. I am so not surprised you are featured sellers on those sites. You guys are so talented. And I think we all have to have our shares of mishaps…I know I certainly do in the kitchen! Thank you for sharing. Love the colors you chose. And yes…you are being too hard on yourself about the green dresser. Smile, thank you for saying those things. You are a great friend!